Vacation rental townhouse. Sleeps 10, 4 bedrooms, 2 bathrooms. Dogs allowed. A beautifully and completely remodeled home that is truly an oasis! The vaulted ceilings in this living room are gorgeous and give it a larger than life feel! Beautiful & bright living room! Brand new & bright dining area is sure to be a gathering place for you & your group! Additional seating is provided at the kitchen bar. Custom built cabinets and granite counter tops make cooking in this kitchen a dream! The kitchen is almost finished! Bedroom 1 contains a Queen bed and a lot of charm! Bedroom 1 is located on the first floor. This guest bathroom is located on the first floor and is newly outfitted with granite counter tops, a walk in waterfall shower! This first floor bedroom #2 has a Queen bed and a TV mounted to the wall for guests' use during their stay! Bedroom 3 is located on the second floor and has a Queen bed and huge walk-in closet! The owner is putting the finishing touches on this giant walk in closet attached to Bedroom 3. The Master Bedroom has 1 King bed, and 1 Twin bed with a Twin trundle below. The owner has also provided a Pack n' play, baby gate and high chair in the Master bedroom for families with small children. This second story balcony is attached to the Master Bedroom allows you to enjoy glimpses of sand dunes and fresh ocean air! Bathroom #2 is located on the second floor and comes with double sinks and a bathtub. Grill out, hang out or share meals together on this over-sized wrap around deck! Brand new natural gas grill installed & ready for all of your grilling needs! One of two hot/cold outdoor showers at this rental home! The outdoor space never stops! Enjoy another section of the "oasis" in this side yard area that will be furnished with lounge chairs strategically placed in a prime tanning location. You are just steps from the sand! Just steps from the peaceful North Beach! Rooms Sleeps 10, Bedroom 1: 1st floor Queen Bed, Bedroom 2: 1st floor Queen Bed, Bedroom 3: 2nd floor Queen Bed, Bedroom 4: 2nd floor King Bed with Twin day bed & Twin trundle. Amazing location to access the beach. However, you will need to make sure to bring your own TP!!! The location is excellent. Beach is beautiful and quiet and only a block from the house. The house was very spacious for the 6 of us with a lot of seating and a nice large dining table. The backyard deck was beautiful. We enjoyed coffee there every morning. The grill was nice although it was dirty and we had to scrub it. Unfortunately I have never stayed at a vacation rental where I had to put sheets on the beds and find pillows and blankets in the closets. One of the blankets was stained/dirty (which we were able to clean after throwing in the washer) and the rest of the blankets/comforters were inadequate. There was not one garbage bag available for our starting use which would have been nice to have the first afternoon. This was the most unstocked rental we have ever stayed at in terms of spices, paper goods, detergent, etc... but after making a grocery store run, it worked. We were very surprised that there were no dish towels available since one of the expectations of guests is to put all dishes away at the end of the visit. Also, no beach towels are provided. 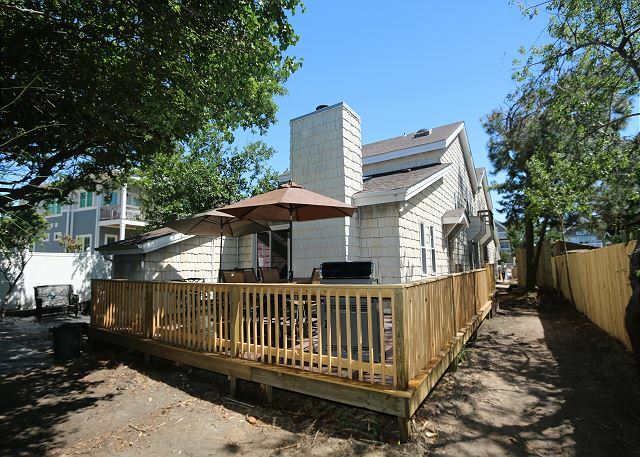 111 67th st is a perfect beach rental! Our family celebrated a 60th birthday at this property and loved it! Everything is almost brand new inside including appliances, bathrooms, floors, furniture etc. Its a VERY short walk to a gorgeous beach. The beach is not crowded and there is lots of wildlife and dolphin spotting. We loved the deck with the gas grill and spacious table. The grill is hooked up to city gas and also clean and new. The owners provided great chairs, a wheeled cooler, an umbrella and a boogie board! The only thing I can say we wish it had was more wine glasses. There were 8 of us and 6 glasses. Also, champagne glasses and room darkening curtains for the bedrooms would be nice too. The beds were very comfortable and the linens also looked fresh and fairly new. Note: beach towels are Not provided. The rental company was organized and everything went smoothly with them too and when we decided to rent extra umbrellas they were very quick to deliver! This was one of if not the best beach rental experience we’ve ever had! BEAUTIFUL AND CLOSE TO THE BEACH! This house was perfect for our needs, it was clean and well furnished, the beach is a short hop skip and a jump away! Management was every professional and very quick to answer questions. I would stay here again if (when) I come back. definitely was more than I expected! Thank you so much for your amazing review! We are so glad to hear about your stay! We hope you will come and stay with us again soon! We really enjoyed our first stay in Virginia Beach at 111 Oasis. The location couldn't have been better for staying with 6 kids. Our only complains had to do with the garbage pickup. The garbage from the previous visitors was still there and by the time we left, the garbage cans were covered with maggots. By the end of the stay the refrigerator and freezer were totally not working. Other than that, everything was great and we enjoyed ourselves. Everything else, was fantastic. Our rental company did fantastic at getting someone out to fix our unit, even sending someone on a Sunday to at least get a preliminary peek before we got it all fixed up on Monday. The beach being RIGHT next to us was fantastic, and there was plenty of room to enjoy ourselves comfortably. There's so many chairs out in the back, all comfortably arranged, that any and all persons could find comfortable seating with their entire extended family there. It's awesome. The grill was key, the outdoor patio table was clutch, and the family dining table gave us now-certified grown ups a chance to show off our adult cooking techniques. All in all, this place is great for anyone who needs a getaway, who wants to relax, and who loves them some ocean. Will visit again! Anchor Realty was so great to work with - we have a small child who needs to nap and they were flexible on checkout times. They were so friendly and accommodating. The house was beautiful and very clean. We would stay in the same house again! VA Beach House on 63 street. The house was great. Very clean, perfect for what we needed.